Don’t know which bridal makeover look to use for inspiration or who to hire as your makeup artist? We’ve got 11 amazing before and after makeovers to help you choose. 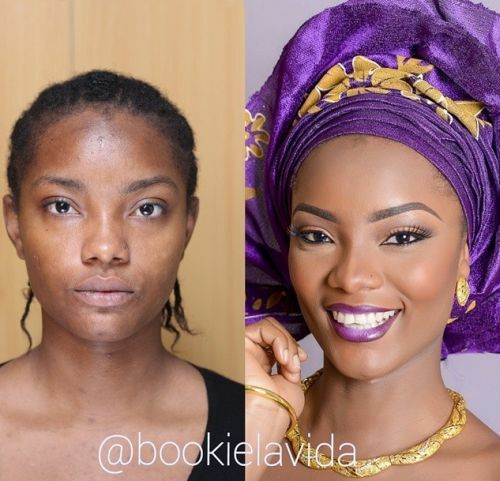 If you’re a bride-to-be, a bridesmaid-to-be or will be a wedding guest soon, getting a good face makeup will make you look brighter and prettier, without looking over-made-up. 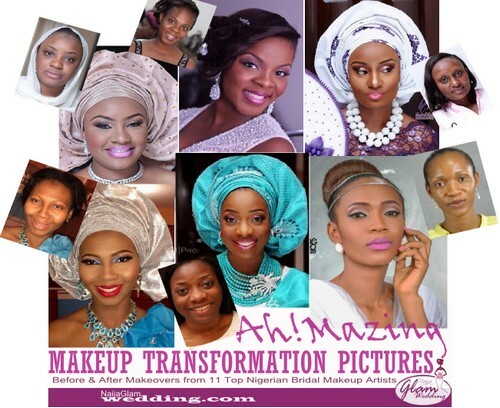 In this post, we want to share with you 11 amazing Nigerian wedding makeup pictures that will make you go ‘wow’– before and after makeup photos of brides, mothers and grandmas that made our jaws drop – while saying wow, wow… Scroll down to see our favourite before and after bridal makeover pictures from some of Nigeria’s best makeup artists (we also included the artists’ contact information below). 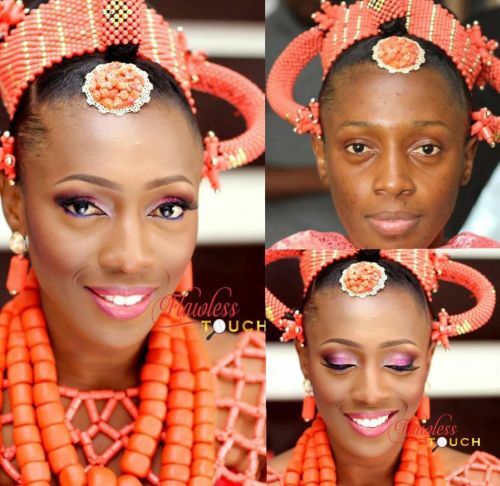 Check out our curation of the awesomest Nigerian before and after bridal makeup photos below. 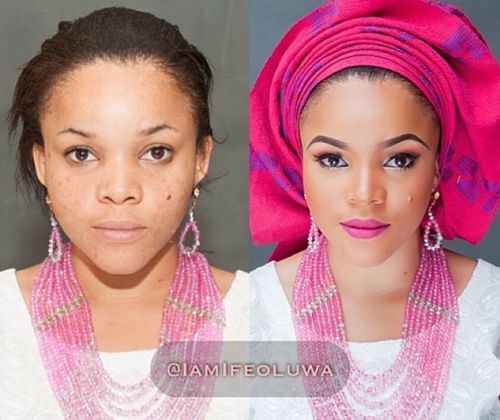 You’ll see the transformative power of makeup in the before and after makeup photos below – to find a great makeup artist to call when you have a wedding or want to attend a red carpet occasion – they say, seeing is believing. 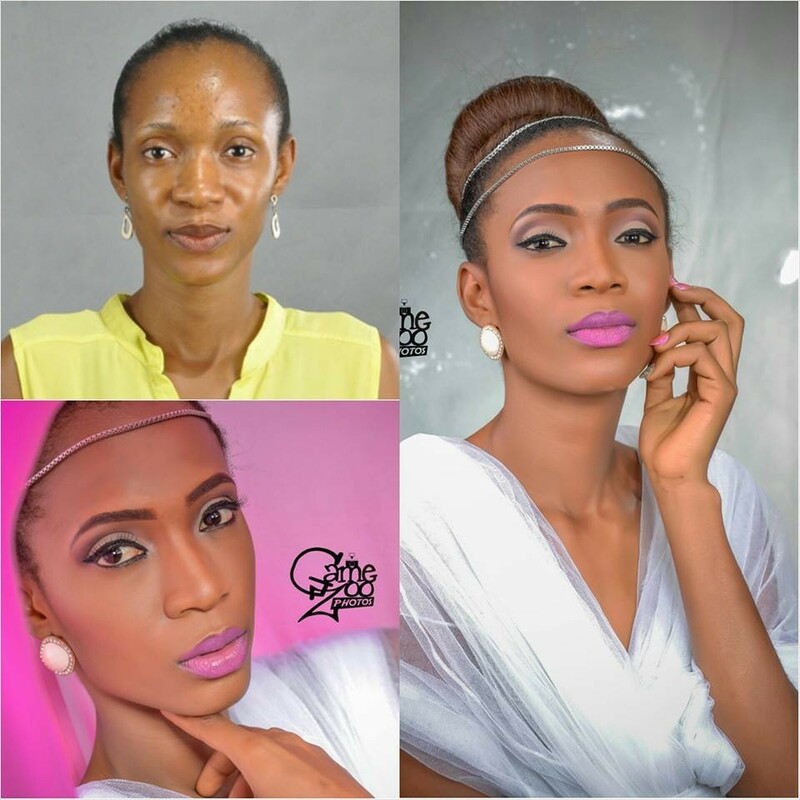 Now, see the awesome makeover pictures below – they are in no particular order. Services: Bridal and All kinds of Makeup, headgear tying (single and Double), Nail Extensions, Bridal hair and Eyelash Extensions, home service and makeup training courses. 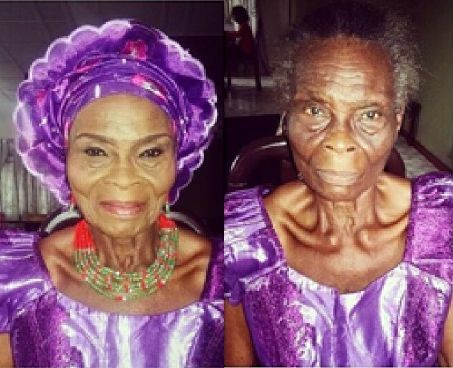 Amazing makeup transformation of a grandma; I really like this makeover but don’t know the name of the makeup artist. 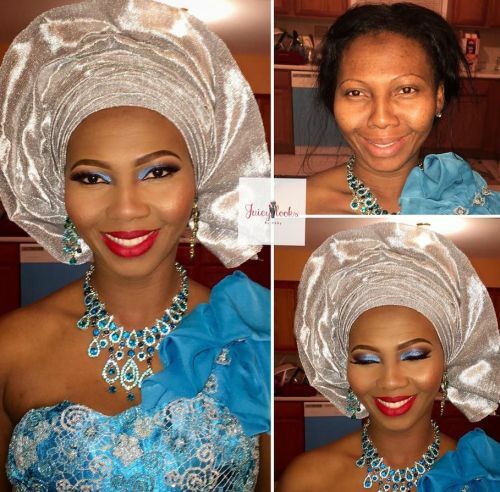 NOTE: Just in case the makeup artist who did this face comes across this post, please leave me a comment to let me know your name and contact details, so I can include it here for our readers (brides) who want to contact you. 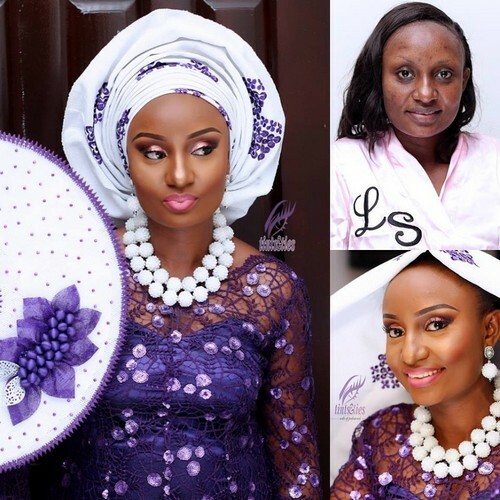 I hope that our readers who are presently preparing for their weddings will be motivated by these before and after wedding makeup pictures for Nigerian traditional and white wedding. The above makeup artists whose works we featured above are some of the best in Nigeria, and most of them do travel outside their base if you ask them. Follow them on Instagram and Facebook to contact them. Are You a Makeup Artist that Wants Your Work to Be Featured in Our Next Before and After Post? Our readers are mostly brides-to-be who are presently looking for, and hiring wedding vendors and looking for good makeup artists. And they always ask us to tell them names of good makeup artists in the states where their wedding is holding. That’s one of the reasons why we wrote this article – to showcase talented wedding makeup artists to our fast-growing audience who would walk down the aisle soon. Nigeria has a lot more talented makeup artists than we showcased above, we would like to know them and list them for thousands of our daily readers. We are aware that there are lots of great makeup artists that we at NaijaGlamWedding haven’t even discovered yet, and if you’re one of them, don’t be a stranger – become our friend on Facebook and GooglePlus so that we can easily see your handwork to show to our website readers. We’re also on Pinterest and Twitter (@naijaGkamWED), and Instagram (@naijaglamwedding) – follow us and say hi. Which Is Your Favourite Makeup Before and After Picture? 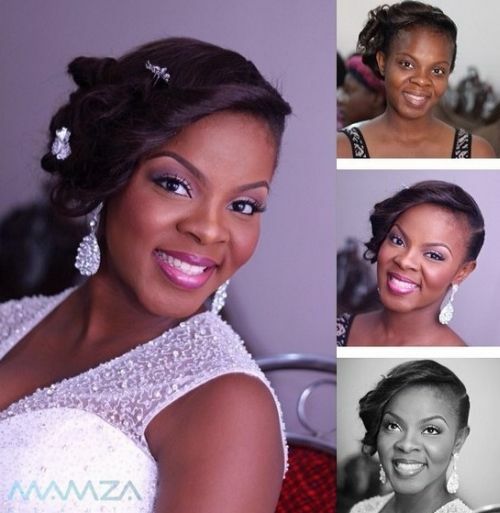 If you’re a bride-to-be or would be a wedding guest soon, hopefully, the above before and after wedding makeovers have inspired you on which Nigerian makuep artist to hire for a glam wedding-day makeover for you and your bridal party. I bet you’ll agree that a hobbyist or amateur friend or relative cannot do a professional makeup like any of the above. If you liked this article, please share it with your friends on Facebook, Instagram, Googleplus, Twitter, email – everywhere. So, tell me in the comments down below – would you hire a makeup artist for your wedding makeover or are you having a friend or sister or yourself do your makeup on your wedding day? 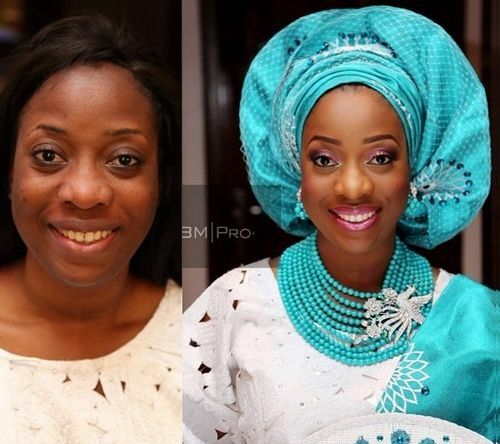 I’d also like to know which of the above before and after bridal makeovers is your favourite. Contact the makeup featured artists directly – scroll up for their contact info. @naijaglamwedding is our INSTAGRAM NAME. Hi Trish. start by following us on social media – instagram, Facebook, Twitter etc. Tag us with your quality makeup words, and you may be lucky to be one of those we’ll feature next. Thanks for your interest. Do you only feature make up on your blog? What about all other wedding deals like wedding gowns,bouquet,bridal beads,hair accessories and wedding cakes? Hello Abisola, welcome to our Nigerian Wedding blog. We cover everything weddings. Please note that this post is not an advert or deals-news, but a guide to inspire brides on different bridal makeup styles and looks they could rock on their big day. We have features of wedding-day inspiration on wedding gowns and bridal trad attire, wedding cakes, bridal beads, hairstyles and wedding guest looks. You can browse them all here (click here). AND, in case you’re asking about how to advertise here, click here to find out – very affordable. Hi Omobola, the info on how to join is up here (scroll up) – you should see the yellow highlight area with ‘JOIN FREE…) – click there and join. Thanks. Hi Bisi, go here https://naijaglamwedding.com/submissions/become-a-contributor/ – for information on how to submit a guest article to us – see details of what we look for. Thanks Tega and welcome to NaijaGlamWedding. There are 2 ways to get featured on our site: (1) guaranteed feature by purchasing advertisement – they are cheaper than you think (2) join our ‘wedding vendors’ group on Facebook and you could get featured for free if you keep posting awesome wedding makeup pics. Once in a while we feature some of the makeup artists works that we think will inspire our readers who are mostly brides-to-be (the link to our Facebook group is towards the end of this post – scroll up). 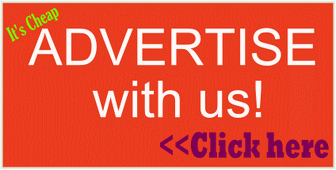 Our advert rates can be found here. You’re welcome, Margaret. I really loved that makeover – you killed it there, gurl! Well done, and keep doing great makeup. wowwww big thank you naija glam weddings i am honored.thank u!!! Thanks for stopping by, Lamide. It’s our pleasure to showcase the awesomeness of your ‘before and after makeup’ to our brides who are always asking for our makeup artists recommendations. Amazing! 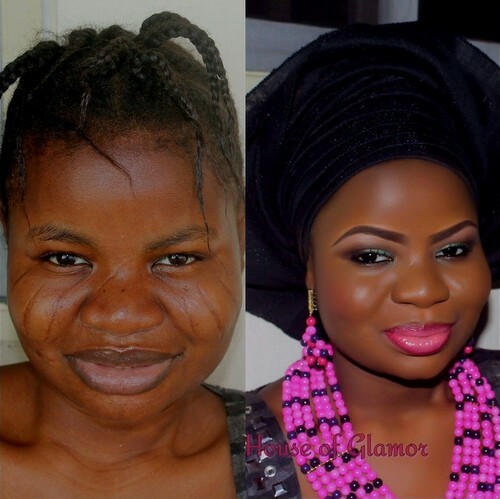 I love the power of makeup! Thanks BellaDivas Makeovers. 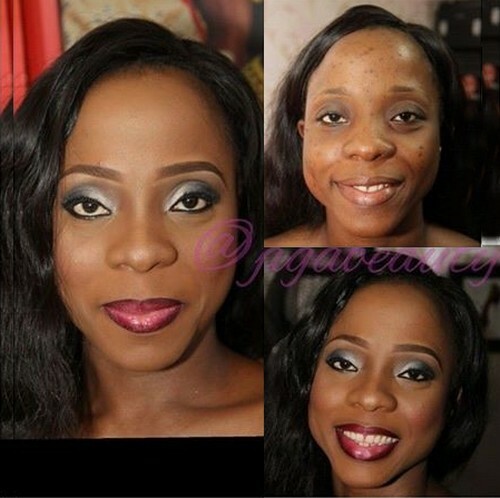 It’s amazing how makeup can easily improve the looks of anyone, in a matter of minutes. And you do that so well. Thanks for stopping by. Hi Precious, all the featured makeup artists offer training. And you can easily contact them directly using their phone numbers and social media handles (all listed above).